The World’s Fastest two-sided all-in-one, the WorkForce 845 delivers high-speed, automatic, two-sided printing, copying, scanning and faxing while providing high quality prints your business deserves. 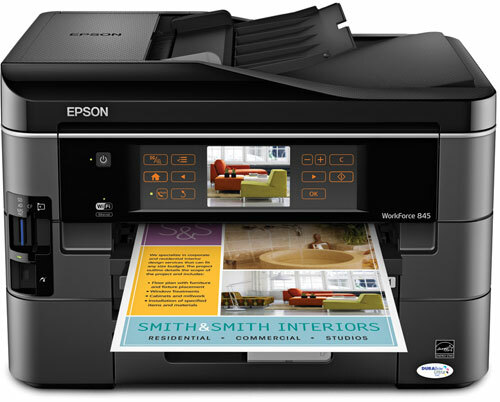 And, it makes it easy to print multiple pages with a 500-sheet paper capacity. Save on ink with the included Extra High-capacity ink cartridges — up to 40% less printing costs than color lasers, a savings that helps make business printing affordable. Easily share your all-in-one with multiple PCs with built-in wired and wireless networking. 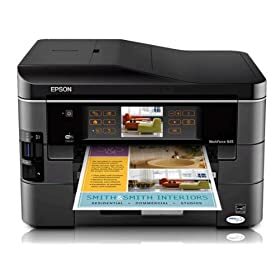 Or, use Epson Connect to print from popular mobile devices. Built to perform, this powerful product is the perfect partner to help keep your business running at full speed. ISO ppm is based on the international standard for measuring print speed. Black and color print speeds are determined in default, single-side mode, in accordance with ISO/IEC 24734. Actual print times will vary based on system configuration, software, and page complexity. Packaging Specifications (W x D x H) — Dimensions: Printing 17.6" x 22.3" x 12.3", Storage 17.6" x 14.5" x 11.8" and Weight 22 lb.